YOU'RE ON VACATION NOW... START ACTING LIKE IT! 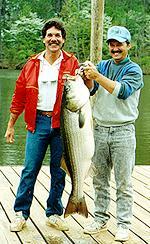 Come and enjoy Striper Fishing and water recreation in the Blue Ridge Mountains of Southwestern Virginia on beautiful Smith Mountain Lake. May 3, 1988 - 42 lbs., 6oz. 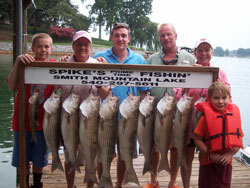 We are full time resident guides since 1988. We are U.S. Coast Guard Licensed. Two completely equipped 22ft. 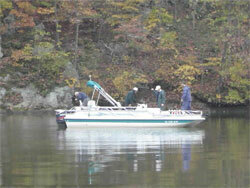 deck boats make up our fleet and accommodate parties of up to 6 each, using live bait and artificial lure techniques. All equipment is provided, along with pictures of the day's catch posted on our Spike's Prime Time Fishin' Facebook page and your fish filleted and packaged. 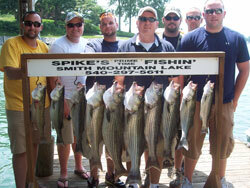 We will customize the trip to fit the needs of your group according to their angling experience. 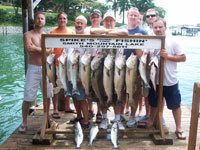 Entertaining your business associates or guests to teaching the latest fishing patterns and techniques is our specialty! But if you're shopping for the cheapest rate, don't call us. We operate a "FIRST CLASS - ON THE FRONT ROW" business. You get what you pay for and you deserve the best. 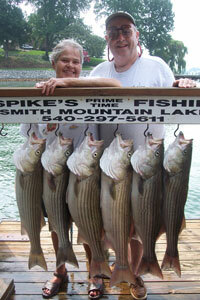 Top off your visit at Smith Mountain Lake by staying in one of Spike & Kathy's waterfront vacation rentals. Enjoy our "million dollar" view and convenient location in one of our superb units. 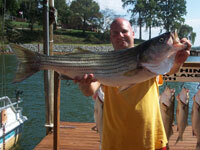 Leave straight from our docks on your Striper Fishing Charter or kick back on our beach or docks and enjoy yourself on beautiful Smith Mountain Lake. 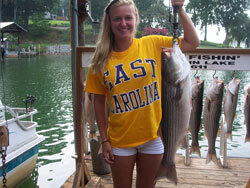 TIGHT LINES & SCREAMIN' REELS!! !